Who are these people and when ARE we? 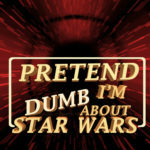 Tom Merritt’s attempt to forget everything he knows about the Star Wars universe and embrace the story in episodic order. Big thanks to Ryan for the graphic. Get the music! Live from the Cantina at more from andrewallentrio.com. Yep, you’re doing exactly what the title says, and it should be fun, but I think there must be such a thing as pretending to be *too* dumb for words. I’ve heard all of these so far, and my brain hurts as if I’ve lost at least half my IQ. Fandom used to be fun; so the fault is undoubtedly mine, sorry. I think it’s interesting to see this from a “dumb fan” point of view, given that up to now, you saw the movies all chronologically. When you think of all the historical fiction movies we see, we don’t see them in chronological order, so we rely on signals to tell them when they take place. Or there’s an explicit date, but that wouldn’t work in this case. So I liked the whole mystery of when the movie takes place compared to the other ones. I also think it’s interesting that if you basing your views just on the movies, you would have a fairly black and white view of rebels vs bad guys, and this movie brings the murky greyness of these kind of huge political struggles, and your “confusion” (maybe some of it not even in quotes, based on what you’ve said in other places) about who are the good and bad guys. On the other hand, I think you could have been a little less dumb about K2 and realize that while he looks like an empire robot, he’s been reprogrammed by the rebels. They only mentioned that every time someone new met him. Star Wars was a cinematic universe before Marvel or DC even thought of the idea. The fact they can have stuff out of chronological order and jump back and forth across time and characters just underscores that fact. Thanks for more great Star Wars commentary. I can’t wait to see Episode 8!